Paper Dolls are a great way to learn more about the history of what people wear now and have worn in the past. Our clothing says a lot about our society and our lives. Besides that, paper dolls are fun to color and cut. I drew the paper dolls offered here at PolyMarket Press for my own amusement after studying Costume History and Design in college, but I like to share–so I sell them too. Some of them have appeared in DollMaker Magazine, and all of them are due for a refurbishment soon, as I plan to put them into .pd form and make them available for people to download and print themselves, along with a tutorial of how to use programs like Paint, Photoshop, to color them in digitally and print them out, or print in black and white. Then color them in! I still love to spend time with my felt tip markers or colored pencils. 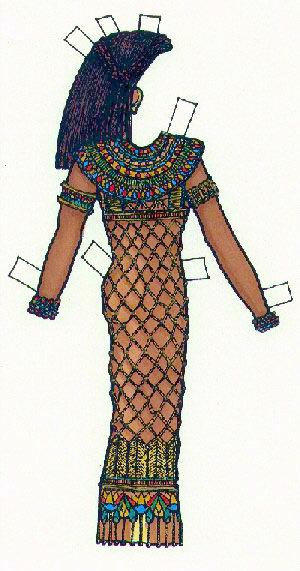 Here’s an example of one of the Egyptian Princess costumes colored in using Sanford Prismacolor Markers. This is amazing. I’ve always been a fan of Egyptian history and culture and part of it the colorful costumes and the beautiful headdress.